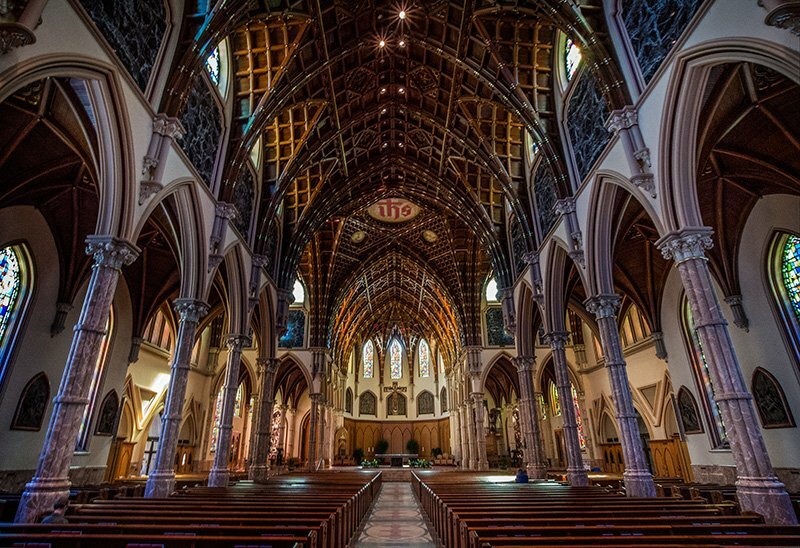 Continuing my Chicago series on architecture, we visited the Holy Name Cathedral. This is an example of another gothic revival architectural style. 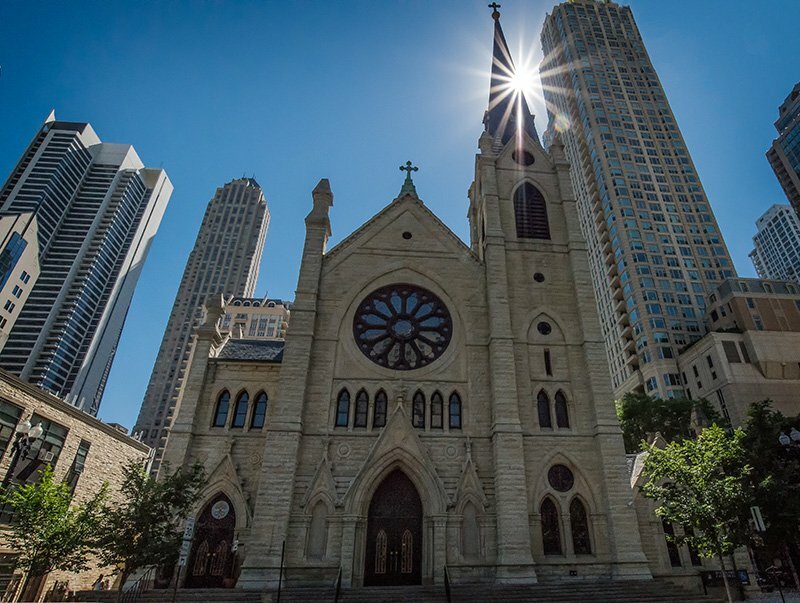 Holy Name Cathedral is the seat of the Archdiocese of Chicago, one of the largest Roman Catholic dioceses in the United States. Holy Name Cathedral replaced the Cathedral of Saint Mary and the Church of the Holy Name, which were destroyed by the Great Chicago Fire of 1871, and was dedicated on November 21, 1875. The first feature that greets worshipers are massive bronze doors that weigh 1200 pounds each. The doors introduce the overall “Tree of Life” theme with intricate details that serve to make the doors look like overwhelming planks of wood. Six tons of monolithic red-black granite forms the table top of the altar. The pedestal is encircled by a bronze bas-relief depicting Old Testament scenes of sacrificial offerings and preparation: Abel’s offering of the first sacrifice, the priest Melchizedek giving bread and wine, Abraham’s willingness to sacrifice his son Isaac, and the Prophet Elijah receiving bread and water from the Angel of the Lord for strength to continue on his journey. 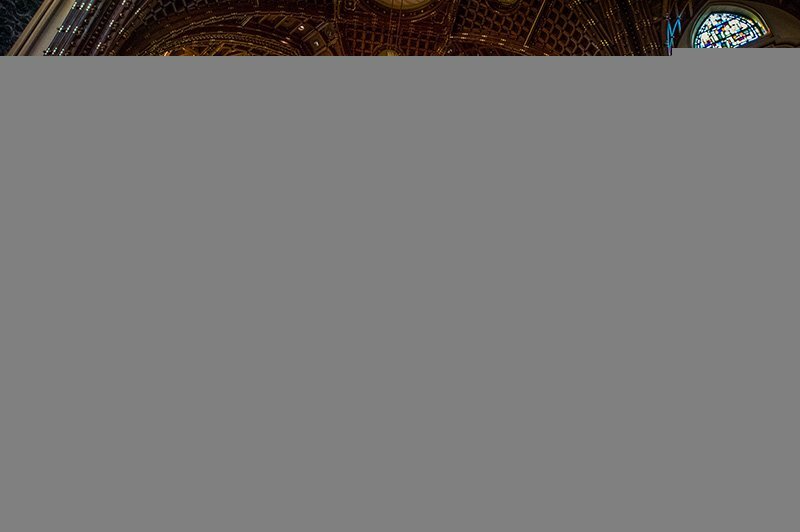 The consecrated altar contains relics, or actual artifacts from the bodies of Saint John the Apostle and Saint Timothy. The existing structure standing today is not without its current perils. Early on the morning of February 4, 2009, a fire broke out in the roof structure of the Cathedral. The fire began at approximately 5:30 local time and required two and a half hours to put out. The facility suffered extensive water damage. Fr. Matthew Compton, along with the security guard and janitor, entered the burning structure and rescued the Blessed Sacrament. Firefighters entered the burning attic without their helmets and oxygen tanks. A fire in the attic of a building in the style of Holy Name Cathedral is usually declared a loss and just contained; the action of the firefighters that day saved Holy Name Cathedral. Divine intervention, perhaps, but I was glad that I was allowed to photograph and bring home some keepsakes of such a beautiful structure.